mike was working on his test in the kitchen when i woke up this morning. sleepy eyed and with my hair in a craze, i waved to him then stumbled into the bathroom, trying to wake up. friday. i don't have to say anything more, just the word "friday" is enough. i got dressed, and before i left the house, kristine instant messaged me from the office, "get to work!" she wrote. kristine, who had been MIA all this week from a mysterious viral infection, was back at work pending a phone call from her doctor letting us know if she was still contagious or not. i finally left for the train station. 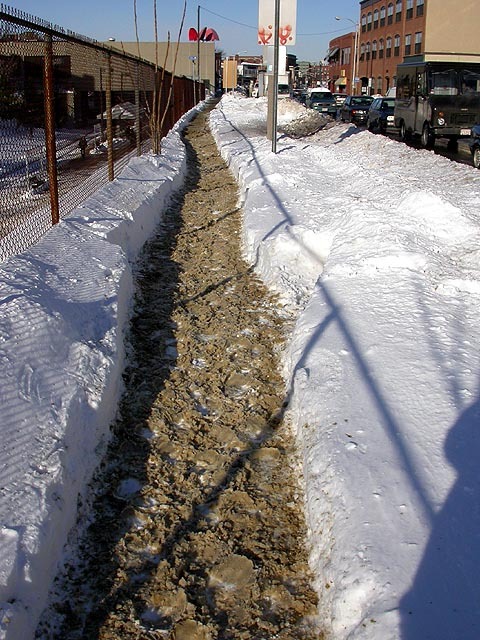 i wish the snow would hurry up and melt, so all those drivers can go back to car commuting again, so the subways won't be so crowded in the mornings when i go to work. 30 minutes later i was in boston. i bought some stamps from one of those holiday season united states postal service stamp vans before arriving at the office. i wanted to go running during lunch but there was nobody who wanted to go with me. i would've gone alone, had i remembered to bring my shorts. when i went outside to get lunch, that's when i realized it would've probably been too cold to run in shorts anyway. i went to taiwan cafe, where i picked up an order of smelly tofu i had phoned in 15 minutes ago. i then went to sun sun supermarket to get some snacks. there was a long line for some reason, holiday shopping frenzy hits chinatown as well. carly and i dressed two of the rubber squids from the office. i have them posed inside of an empty cardboard box, just so i could get a feel for the final look of the photos i'll be taking of the squids for next week. 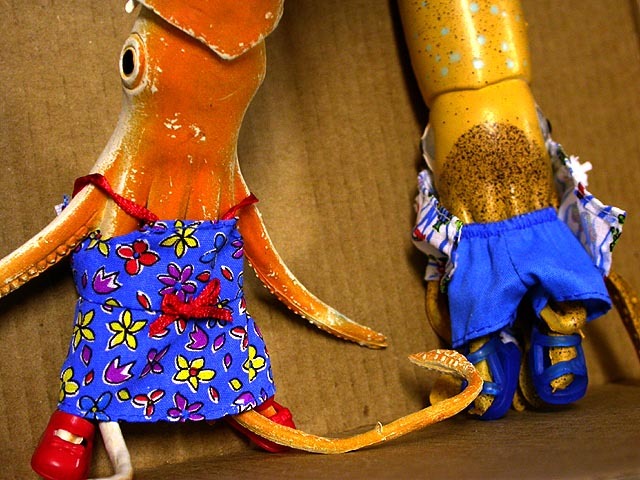 the squids didn't look so bad all dressed up in tiny doll clothes. i can wait until we build the miniature diorama set for the squids, i'm spending all weekend searching for items to include in the scene. i made some corn chowder from a can after i got back home from work. i don't think it agreed with me though, i felt kind of ill afterwards. the roommate was gone, the thermostat left at 70 degrees. a nearly full can of soda was left opened in the living room, i took it upon myself to finish it. some dirty dishes sat around the edge of the sink, left unsoaked, the food hardens on the plates. whatever good ill that was fostered last night quickly diminished. 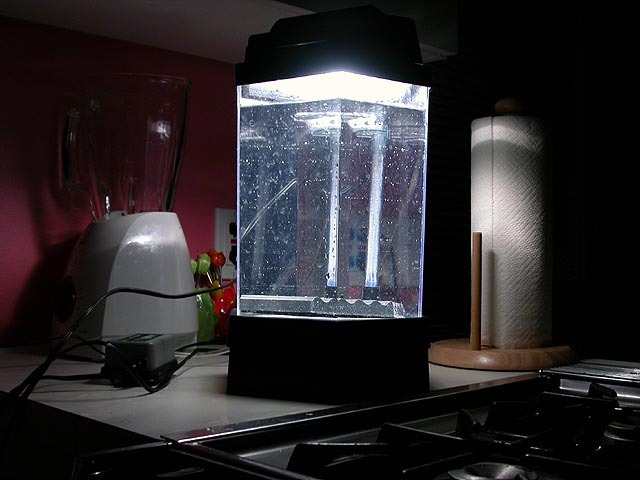 i tested the mini-aquarium before i went to bed, filled the thing up with tap water, ran the filtration system. i need to get a heater for the tank as well, it didn't come with one. i envision a lot of aquatic plants and perhaps 4 fish maximum (i probably can't get anymore, the aquarium isn't big enough to sustain anymore), red ones to contrast with the green.